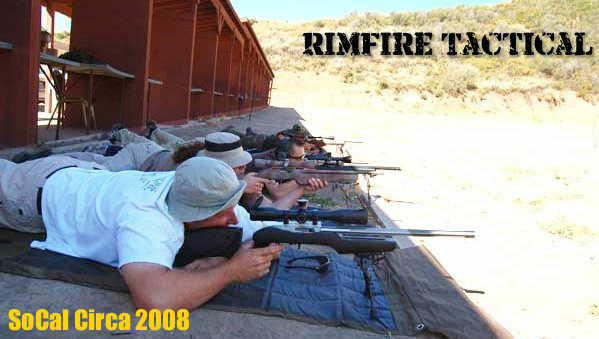 We believe in the benefits of rimfire cross-training. With a rimfire rifle that has the same ergonomics and “feel” as your centerfire rig, you can practice more often and more affordably. You can get good rimfire ammo now for under $5.00/box (ten cents per round). Compare that to centerfire factory ammo at $1.40/round or handloads for about $0.70 (bullet, primer, powder, and brass depreciation). We know some successful PRS shooters who shoot five rimfire rounds in practice for every centerfire round. 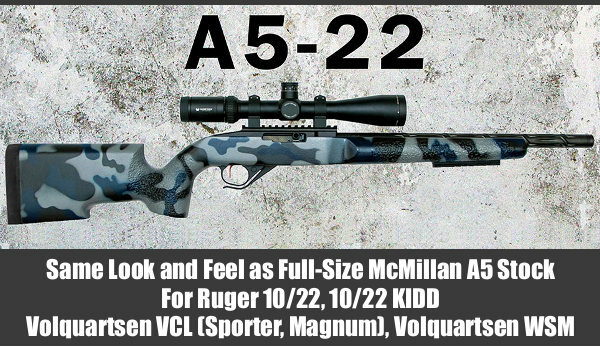 While the new McMillan A5-22 stock was designed expressly for the Ruger 10/22 barreled action it can be inletted to fit other rimfire actions: KIDD 10-22, Volquartsen VCL (Sporter and Magnum), and Volquartsen WSM. With a basic inlet, the A5-22 costs $390.00. Uninletted (flat-top) version costs $338.00. Available options include cheekpiece, pad, studs, and rail. Tac-22 ammo is available from many vendors. MidwayUSA currently offers it for $4.49 per 50rd box or $34.99 for 500 rounds. That’s just seven cents per round with the 500-count box — a great deal. Many guys who shoot long-range tactical matches practice with .22 LR rifles of similar configuration. Rimfire ammo is way more affordable than centerfire, you do not need a big range facility, and shooting rimfire saves wear and tear on your centerfire rifle. Further, for learning how to read the wind, there really is no better training tool than a .22 LR, even as close as 50 yards. In California, various clubs have been running rimfire tactical matches for more than a decade now. Hit/miss reactive targets are typically placed from 50 to 150 yards. Some matches combine steel plates with bullseye paper targets so accuracy is important. An accurized 10/22 can be competitive in these matches. A new .22 LR rimfire shooting discipline has been developed, copying the PRS series. The ELEY Practical Rimfire Challenge series matches are positional shooting events in field conditions out to 300 yards. You can use either a bolt-action or semi-auto .22 LR rimfire rifle. Much like PRS (Precision Rifle Series), competitors will shoot from a variety of positions: prone, strong/weak shoulders, standing, sitting, and kneeling. There will be shots from barricades, and movement from position to position during stages. SHOT Show Report: Volquartsen Fusion–Ultimate 'Rimfire Tactical' Rifle? Share the post "Rimfire Rigs for Tactical Cross-Training — McMillan A5-22"
The best rifle to cross train on for tactical shooting is .. the rifle you use in tactical competition. Any rimfire rifle is just as lucky to teach you bad habits because of the shorter distances, lower recoil and different ergonomics (no two rifles ever “feel” the same). If you want to talk cross training, think using your tactical rig in different completion styles to build technique, stamina and familiarity. Editor: Really strongly disagree. You should ask some of the better PRS guys… I personally used a rimfire to get weekly trigger time close to home (I had a rimfire range 4 miles away). I noticed an immediate improvement in my scores on hit/miss reactive targets at 400-600 yards, and my long-range groups improved, with fewer unexplained flyers. I also improved my trigger technique. I found that, with rimfire, if I did ANYthing wrong (e.g. not pulling straight back) — I saw the results on target. By improving trigger consistency I improved my long range shooting, even tying a range 600-yard prone-firing silhouette record. AnschutzUSA is using Manners tactical stocks with their 1620. The CZ455 can also be found with that Manners stock. Richard is wrong. While its best to train with very similar rifle , rimfires by themselves are much less forgiving to bad tecnique simply because of their long barrel time .so shooter error is much more pronounced. Richard is not wrong. You guys need to read what I said more closer. Cross training is the key. PRS is not the same as shooting for score and score shooting gives you those skills in spades while using your equipment. Another example. I got a 22 pistol to train for centre fire. 90% size, similar trigger, sights. The reverse happened – the more I used the big 9mm the more key muscle groups, sighting technique and endurance developed … and the better the 22lr groups got. If you want to train every day, dry fire a course in the back yard on miniaturised targets. Condition your body and mind to the matches. If you want to improve trigger control, balance a coin on your barrel as you cycle and fire. Much cheaper and even more effective because you are using your competition gun.